His uncle, Calixte Henri, also a renowned artist, and his daughter discovered Widson’s works. His father at this time became aware of his son’s artwork and requested that he only paint during school holidays and not during the school year. Rameau finally affirmed his son’s talent for painting: when Widson was fifteen years old, they started working together, sharing a studio and critiquing each other’s work. Rameau and Widson spent 16 years painting together until his father died suddenly in a car accident in 2014. Nonetheless, Widson continues to bring beautiful works of art into the world, painting with his father’s memory in his heart. I met Widson on the 2018 Haiti Trip during our Spring Break, when I had the opportunity to interview him. Having heard many stories about him prior to the trip, I was especially excited. He is a lovely young man with an amazing gift in painting beautiful boat scenes and the Haitian voodoo culture. Despite his father’s passing and the emotional burden that followed, Widson eventually overcame his sorrow and continues to paint the beauty of Haiti. He was very passionate in sharing with me about his life story, about how he started painting secretly and eventually gained his father’s recognition, and how he missed those times when they would paint together. Widson showed me the unwavering strength and dignity that Haitian people possess, and his story continues to inspire me as I strive to work harder with the project in supporting the artists in Haiti. Fresh Haul | Widson Cameu | 7" x 18"
Size: 7 in. x 18 in. Free Wheeling | Widson Cameau | 8" x 10"
This painting, completed in 2011, depicts recent tragedies in Haiti’s modern history. 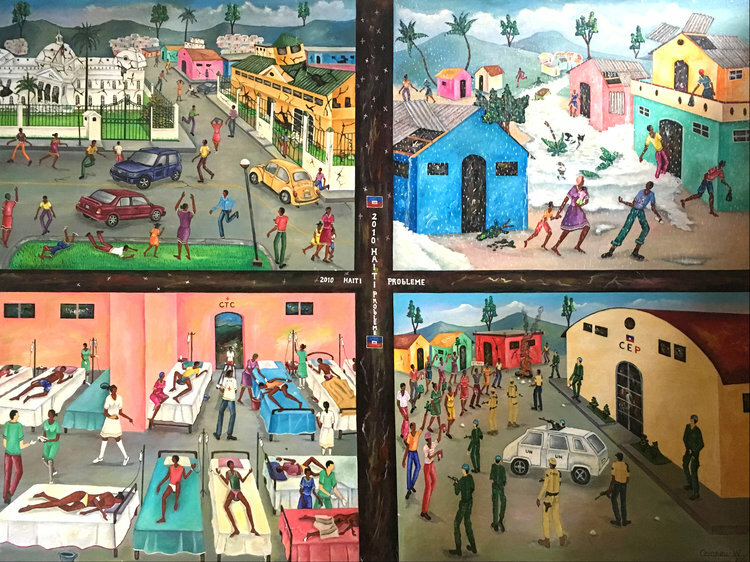 The four panels respectively illustrate impacts of the earthquake, flooding from hurricanes, the cholera epidemic, and political protests. In order to continue sharing the depth and meaning of this historic piece, it has become a permanent fixture in our collection.